Just found this and thought I’d pass it along. Timelapse Montage from Mike Flores on Vimeo. Here we are on the precipice before Tuesday’s elections. I am encouraged by the momentum of Sean Beilat in Massachusetts against the reprehensible Barney Frank and even have some hope that perhaps an honorable man might move the liar Cleaver out of my congressional district. Hope springs eternal….. While thinking about all that’s at stake during this election [granted, the O will still be president and will veto all plans by our side–Gridlock is Good!] I’d like to share a tale of Free Enterprise, free association, and good will. Here’s what happens when the ‘stimulus’ for creating jobs and wealth happens spontaneously. 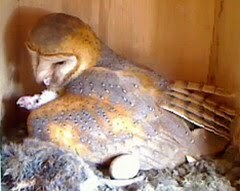 A couple of years ago a couple (Carlos and Donna Royal) installed a barn owl nest box in their spacious yard in southern California to go along with their kestrel box, beautiful gardens, bird feeders, etc. Nothing at all happened for two years, but this past January, after a big storm, they noticed noises coming from inside. This box had been installed with a camera that would transmit to their computer/TV in the house. They fired it up and saw the image of a heart-faced owl in the box. That night her mate showed up and the game was on! The adults were named Molly and McGee. The Royals enlisted their 15 year- old grandson to figure out how to share via the internet with Carlos’ mother. One thing led to another and soon family and friends were watching. Six eggs were laid and Carlos devised a way to install a night-vision camera and another day camera with sound during the brief absences at night when Molly left the box. Four of the eggs hatched and by this time 2 million people had watched the Owl Box [word got around!] I started watching right before owlet three hatched….and I was hooked. There was a chat room affiliated with the website hosted by Ustream and folks from around the world were there day and night visiting, cheering, mourning and sharing everything from jokes to recipes to advice about pets, etc. It became a huge community of ‘friends’ united by two owls and four owlets. We watched them grow, swallow whole mice [and watched one mouse, delivered alive, make a break for it out of the elevated door! ], turn into fluffy balls of down, venture out of the box and take their first tentative flights. From this community Free Enterprise blossomed. Author Eric Blehm, a childhood friend of the Royal’s son, suggested ‘publishing’ a PDF book for children about the Owl Box. Chris Adams, an artist/designer from back east, also a watcher, signed on to do the paintings. Orders poured in. Another watcher, artist John Atkinson from northern California, started a subscription for his delightful cartoons published roughly weekly and finally issued as a digital book and a forthcoming DVD. Adams sold prints of the book art. Carlos set up a Café Press site to sell his spectacular night photos–on absolutely every imaginable item, plus calendars, mugs, and on and on as well as many delightful free goodies for adults and kids. A watcher from Connecticut, a school teacher, wrote songs about the owls and recorded them with her students [they’re available from the Molly the Owl Books site]. A woman from Kansas City collected and compiled a cookbook of recipes offered up by the huge community [900+ recipes!] and put together a collection of her limericks and two Lexicon volumes composed of the novel language that emerged in Chat. The book’s author was persuaded to explore publishing a hardcover book in addition to the PDF version and started his own publishing company, Molly the Owl Books, and thousands of book orders poured in. I received my copies yesterday and they are far better than I could have hoped! Now he’s publishing a coffee table book of Carlos’ color night photos due out the end of December. He had a friend, a silversmith, who created delightful sterling charms based on the owls, including one that is a miniature owl nest box with flip-up roof showing four owlets inside! The grandson, by now a true computer whiz, made a DVD with collected photos set to music and sold several thousand of them–enough of them to pay for two years of college–in addition to learning about business licenses, shipping, purchasing, etc. He had a real education. The first clutch of the owls left and the Royals were all set to hit the road in their motor home, but the adult owls moved in again, started a second clutch and ultimately raised two more owlets to fledging. In the end there had been more than 20 million views on the site–from Italy, Japan, England, Dubai, Australia, The Netherlands….. The Royals have finally torn themselves away and are off on a road trip but the community still gets together on-line [at the Ustream site of the cartoonist]. Before they left they hosted a picnic in San Marcos and 400+ folks showed up….including the teacher/musician from Connecticut, a fan from Florida, the Kansas City woman and her family, the author, artist, cartoonist, and many new life-long friends. They’ve helped each other through family loss, health challenges, good times and bad…..in addition to learning more than they ever thought possible about some endearing birds. This is all a wonderful testimony of what a community can do….desires were expressed and entrepreneurs stood up and met those needs. Carlos did live talks via computer with students in classrooms around the country. [In many classrooms, watching Molly and the owlets was a regular part of the school day.] Good deeds ensued with folks donating books and DVDs to schools and libraries as well as to some owl watchers unable to afford the concrete reminders of our time together. Friendships were formed among the chatters that will last until next year when, hopefully, the Royals plug in those camera cables again for the ‘owlcaholics’–and me! Chuck Asay is one of my favorite political cartoonist. His views is so much like mine. In fact, I can’t remember when we ever diverged in our views. Five days until the election. Conservatives and Tea Partiers are getting ready. Dems and libs are fearful. On the national scale, Boxer and Fiorina are in a statistical dead heat (48 Boxer vs. 46 Fiorina). Sharon Angle now leads Harry Reid by two points according to Rasmussen and in Washington state, Murray is barely ahead (49 to 46) of Rossi. Locally, Jacob Turk is single digits away from defeating machine congressman Emmanuel Cleaver. Turk has been fund raising and now running TV ads documenting Cleaver’s statements and voting record. Local democrat pols are fearful their tame voters will stay home this year. In Missouri’s 4th Congressional District, for the first time, Vicky Hartzler is ahead by one point in the latest poll over 30+ year incumbent and Pelosi lapdog, Ike Skelton. I wish I could vote against Skelton. Alas, after the 2000 census, the dem controlled state legislature stripped off conservative northern Cass county and put us into Cleaver’s district. This was done solely to dilute our conservative votes in the democrat cesspool of Kansas City. Now, I think they’ll rue that move when Turk tosses Cleaver on the political trash-heap. I’m normally pessimistic about elections. In the past, I’ve gone to bed early just to get it all over. Not this time. I think it will be a blood-bath with dems falling all across the country. According to more and more pundits and pollsters (I trust the pollsters more), conservatives will take the House and the Senate. According to the latest averaged estimates, the ‘Pubs will gain 80 to 100 seats in the House and will end up with 51 seats in the Senate. I pray it will be so. I should not be surprised, it’s what democrats do. Democrat election fraud for 2010 has already started, so says the Drudge Report. As is my habit, I hit the Drudge Report first thing in the morning. Today, I see two headlines in red reporting democrat election fraud in North Carolina and and Nevada. In both cases, the fraud was attempted using computerized voting machines. Such systems make it easy to alter data remotely. In my past life, I designed databases, data systems, data monitoring systems, installed and operated them. Even across international borders. I don’t trust such systems for such a critical political purpose. They can be hacked or preprogrammed for desired results. Once the data has been changed, you have no audit trail to determine the original desired result. (Yes, I know that databases can backup each transaction. The flaw in that concept is that data can be altered before it reaches that database. Once in, you cannot tell what that original vote was. And, system administrators can also alter data without leaving traces. I’ve seen it done.) It’s either accept everything at face value or dump it all. I’m glad my county uses paper ballots. You mark your choices with a #2 pencil and run the ballot through a scanner. Old technology to be sure, but that paper ballot still exists and can be used again for recounts. And—there are audit trails and accounting procedures that have been time-tested to insure fraud is at a minimum IF the election judges and poll watchers do their jobs. Paper ballots can be numbered and tracked. Theoretically, a computerized voting transaction can too. But that computerized transaction can also be spoofed and/or altered and by-pass audit procedures remotely and no one at the polls with know the difference. I love paper ballots. Long may they be used. I have to admit, I don’t know much about Proposition B that will be on Missouri’s ballot next week. I did a bit of research and really did not find too much. Most of the reports were wildly biased in favor of the proposition and that struck some warning bells. So much of the comments appear to have an odour of PETA about ’em. Fox 4 News, here in KC seemed to have the most balanced report. As I was writing this there was a pro-Prop B ad on the radio. Towards the end, they listed all those who were in favor—a list of liberals and liberal organizations like the USHS. That’s enough for me. If the libs, PETA, USHS and eco-wachos are for it, I’m agin it. For the State Media, there just isn’t any good news. They somehow have the belief they can continue to publish their biased propaganda as news and the people will buy it. The circulation numbers have been released and as you look down the list, only the Wall Street Journal had an increase in circulation. Perhaps due to its conservative editorial board, hmmmm? NEW YORK – U.S. newspaper circulation fell over the past six months at the slowest rate in two years. Figures released Monday by the Audit Bureau of Circulations show that while circulation is no longer in free fall, spending on newspapers is not picking up the way it has for many other consumer goods coming out of the Great Recession. Several trends factor in the decline. Free news on the Web is a big reason. Publishers also have been looking to offset reductions in advertising revenue by raising newsstand and subscription prices, losing some paying customers in the process. And some newspapers have reduced delivery to less profitable areas, figuring the cost of trucking newspapers far afield doesn’t pay off in extra advertising dollars. According to the audit bureau, average daily circulation fell 5 percent in the six months that ended Sept. 30, compared with the same period a year earlier. That’s better than the 8.7 percent drop seen in the previous reporting period, which ran from October 2009 to March. The last time the reduction rate was lower was in the April-September period of 2008, when circulation fell 4.6 percent. Sunday circulation fell 4.5 percent in the April-September period, also smaller than the 6.5 percent drop in the six months before that. The comparisons are based on 635 weekday newspapers and 553 Sunday newspapers that had comparable data for the recent six months and the same period a year ago. There’s more at the site. Below is the list of papers, their circulation and the amount of increase/decrease of subscriptions.